This article is meant to assist you with adding a case. Hover over the “Add Case” button on the action bar on your workspace, and select a program. Complete the fields and be sure to save your work. Please see our Case Screen articles, for more information. 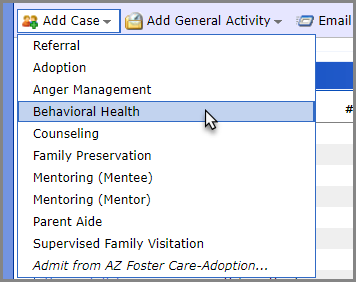 (You must have a Foster Care module in extendedReach for this to function). Please see our Case Referrals article, for more information. Please see our Readmitting a Case article, for more information.